I am a big fan of Firefox and use it almost exclusively for all my web surfing. Firefox was also the only browser that I used when redesigning the theme that this blog comes with. And indeed it looked like this for 75% of all my readers – because they use Firefox. Notice the magically appeared Google Adsense ad on the right! It was not inserted there by me and until yesterday I had no idea that it was there at all! 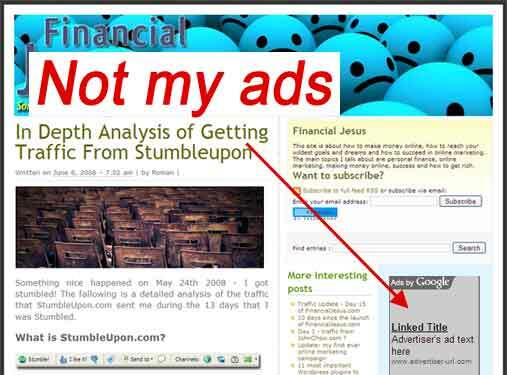 The ad was included by the author of my blogs theme. When redesigning the theme I tried to comment out the code for the ad but I did a sloppy job! The ad did not show up in Firefox but it displayed just fine in Internet Explorer. This was totally against my policy of keeping the site clean and ad free. I have recently added some experimental ads but none of them were above the fold (the part of the website that is visible without scrolling down). 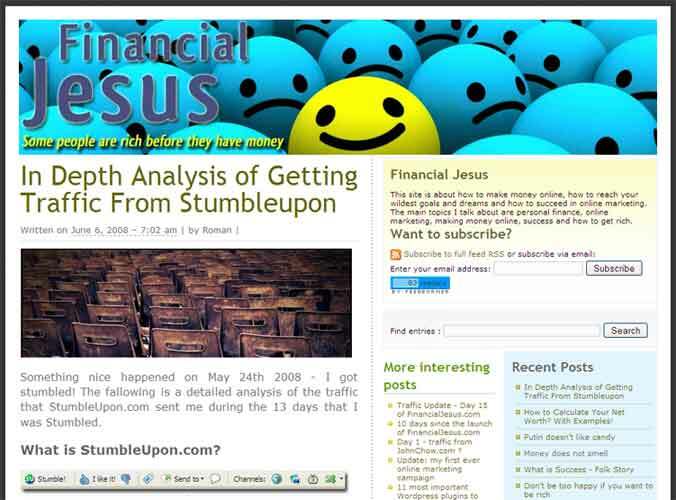 This ad had probably the best CTR on FinancialJesus.com. Unfortunately I have no way of knowing how it did, since it made money to someone else and I don’t have a way to getting my hands on its statistics! If you want to be sure what your website looks like and you don’t like making money for someone else you should check your website with different browsers. You never know when something strange (and somewhat stupid) like this happens! Thats very sneaky of the blog designer to include his adsense code like that. It’s actually a bad idea, because others could be malicious when using their Google code, and perhaps ban his account. I agree that it is not necessarily a good idea, I wonder how profitable that can be for the designer though depending on how popular the theme becomes. Glad to see you got that fixed. I was looking for your contact info (email) for something but can’t find it…maybe you can send it to be on stumbleupon (not here)… or just send me an email. For some reason I haven’t had the time to set up a contact page yet… Hopefully I’ll do it soon! I’ve made a promise to myself that for the end of June I have the blog back at updating 3x a day and all the necessary contact information! Sounds good, if you need any help with anything, let me know. I’d be glad to help in any way that I can…3 times a day is a huge commitment, I hardly ever make the twice per day that I try and achieve. It makes me wonder how I was ever able to pull of 4 times daily when I first started my blog.